"Ford Passenger Car Shop Manual 1949-50-51" This is a reproduction of the manual printed by the Ford that the dealer would use to work on your car. You will find step-by-step instructions for repairing your vehicle with pictures and diagrams on nearly every one of its 319 pages. Learn how to work on the engine, ignition, cooling system, fuel system, transmission (both manual & automatic), rear axle, brakes, electrical (includes wiring diagrams), accessories, and body. You will also find maintenance, troubleshooting, and specifications. The manual covers all models of 1949, 1950, and 1951 Ford cars, including Tudors, Fordors, coupes, Convertibles, Victorias, and wagons. New condition. Buy now to own the best and most complete repair manual available for your car. 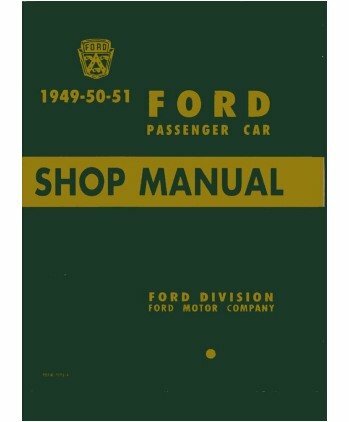 "Ford Passenger Car Shop Manual 1949-50-51"